Can you smell the smoky, salty, delicious aroma of bacon? How about the vanilla and caramel notes in the nose of your favorite bourbon? Join us at Revel Event Center on November 15th for an evening of delicious bites and bourbon sampling. Distilleries from all over the Upstate will pour samples while ticket holders taste porky treats from their favorite local restaurants. Over 60 bourbon brands on-site! 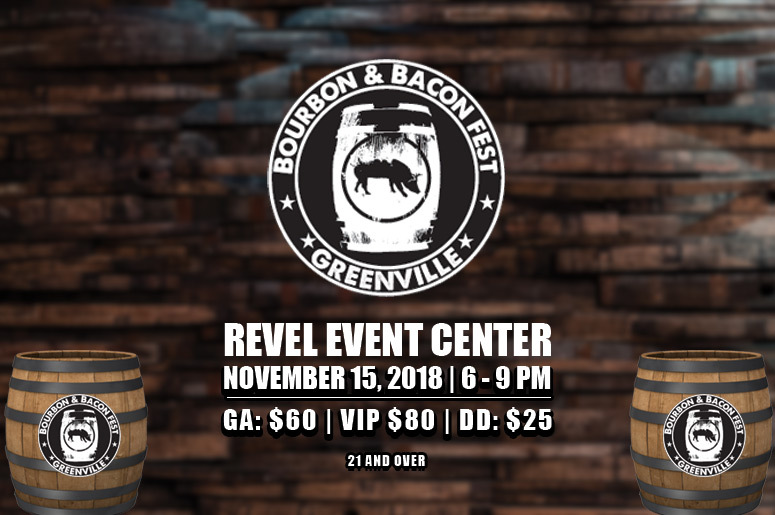 Show your taste buds the time of their lives with some of the best bourbon and bacon-themed bites in the Upstate with Bourbon and Bacon Fest! You’ll sip bourbon from distilleries large and small and taste rich, smoky bacon presented in ways you never even imagined! Tickets are easily tailored to the Bourbon & Bacon experience you’d like to have: General Admission, VIP, and Designated Driver levels are all available. Bourbon & Bacon Fest benefits our friends at Upstate Warrior Solution, who work to connect warriors and their families to the resources they need, and guides them through the process of developing realistic solutions for a variety of areas in their lives. Please note: 10% of ticket sales (minimum of $1k and maximum of $3k) will benefit Upstate Warrior Solution. Purchase of tickets is not a tax deductible donation.